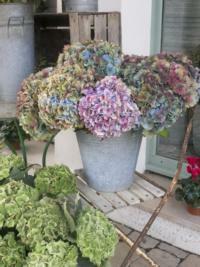 Hydrangeas are a popular plant in Marin and with good reason. They are lush, attractive, and once established, easy to care for. The Hydrangea macrophylla (big-leaf, garden, or French hydrangea), part of the Hydrangeaceae family, is a deciduous shrub native to Asia. The word hydrangea comes from the Greek hydor meaning water and aggeion meaning vessel, so named because the seed capsules resemble a small water pitcher. H. macrophylla is also known as H. hortensia, H. opuloides, and H. otaksa. Its many names are the result of the difficulties 18th century botanists had in attributing specimens to a particular family -- the early specimens imported to Europe from China and Japan produced little sterile flowers which did not have any stamens that could be counted or seed capsules that could be studied. Other species include the climbing hydrangea (H. anomala), the smooth hydrangea (H. arborescens), the roots of which are used in botanical medicine, the peegee hydrangea (H. paniculata 'Grandiflora’), and the oakleaf hydrangea (H. quercifolia). The big-leaf hydrangea is the familiar, "mop-headed" blue, pink, or white species that is frequently seen. Its enormous blossom clusters look like pom-poms and may be 8-10 inches across; each cluster is composed of a mass of 1 to 1.5-inch flowers that are sterile, that is, unable to produce seeds. A special category of big-leaf hydrangea is called lacecap because the flat four to eight-inch flower clusters are composed of fertile central blossoms surrounded by a "lace" of large, flat sterile blossoms. The big-leaf hydrangea has a symmetrical, rounded growth pattern and most garden plants become three to six feet tall. The plants have shiny, broad, coarsely toothed leaves which can be eight inches long, and bloom from June through October. The big-leaf hydrangea remains attractive even after blooming, because the flower clusters -- being composed of sepals and not petals -- do not fall but remain on the plant until early winter. They often change to lovely shades of red, pink, and green, and can easily be cut and dried for indoor use. Q: What sort of growing conditions should I provide my hydrangea? A: Hydrangea macrophylla performs well in areas where winters are fairly mild. It does well in seaside gardens, so it is well-suited to the Mediterranean climate of Marin. 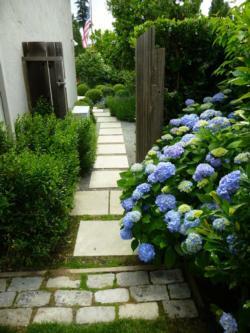 The big-leaf hydrangea will grow in full sun on the coast, but it is particularly suitable for shade. It prefers rich, porous soil which is constantly moist but well-drained, and therefore, would not be a good candidate for a drought-tolerant landscape. Q: How should I care for my hydrangea? A: Hydrangeas don’t require a lot of attention or special feeding. Typically, they are long-lived. Providing an application of a good general fertilizer twice a year and mulching around the shrub is what’s recommended. In the spring after the danger of frost has passed, deadhead by cutting each stem back to just above the uppermost pair of new buds. Be careful to avoid damaging any green shoots as these provide the oncoming flowers. This is the time, too, to remove leaves which have shriveled or browned by frost. Q: When should hydrangeas be pruned? A: The big-leaf hydrangea requires no regular pruning, except to remove dead flower heads and any dead wood. In the fall, after blooming, prune stems that bore flowers to just above the nearest outward facing bud. Any weak or badly formed growths and branches that seem too crowded together in the center of the plant can be removed, thus allowing light and air to penetrate. It is a mistake to cut big-leaf hydrangeas down to ground level or even to prune them severely. Q: Are they susceptible to any pests or diseases? 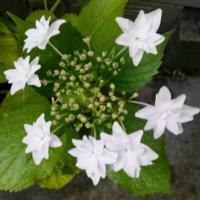 A: Hydrangea macrophylla are generally trouble-free. Aphids, slugs, and snails may occasionally feed on stems and foliage. Very alkaline soil conditions may cause chlorosis, with yellowing between the veins of the leaves, or very pale leaves and flowers. Q: Is it true that hydrangeas can change color? A: Yes! Except for the white varieties, the color of the flowers is affected by the amount of aluminum in the soil available to the plant. Aluminum is present in all soils, but its availability to the plant depends on the acidity of the soil. Big-leaf hydrangeas require acid soil -- pH 6.0 to 6.5 for pink flowers and a pH of 5.0 to 5.5 for blue ones. Some big-leaf hydrangeas switch from pink to blue flowers or vice-versa with a change of only 1/2 point on their soil's pH scale. Plants can be made or kept blue by applying aluminum sulfate to the soil. Treat the soil several times in the spring and fall at weekly intervals with 1/4 ounce of aluminum sulfate to a gallon of water. To obtain or keep pink flowers, add lime to the soil. You can also use fertilizers with a high percentage of phosphorus, which reacts with the aluminum contained in the soil, and the two elements combine in an insoluble form; thus, the aluminum is neutralized and the flowers remain, or become, pink. These treatments will likely not be effective unless they are started before the plant blooms. Big-leaf hydrangeas make wonderful dried flower displays. Drying them slowly is the key. Once the flower clusters have turned the muted shades of fall, cut them and clip off any leaves or browned flowers. Smash the stems with a hammer to help them absorb water, and place them in a container with 2 inches of water. Leave the container in a cool spot out of the sun. The water will evaporate in a week or so and you will have an attractive bouquet of hydrangeas to enjoy throughout the winter.